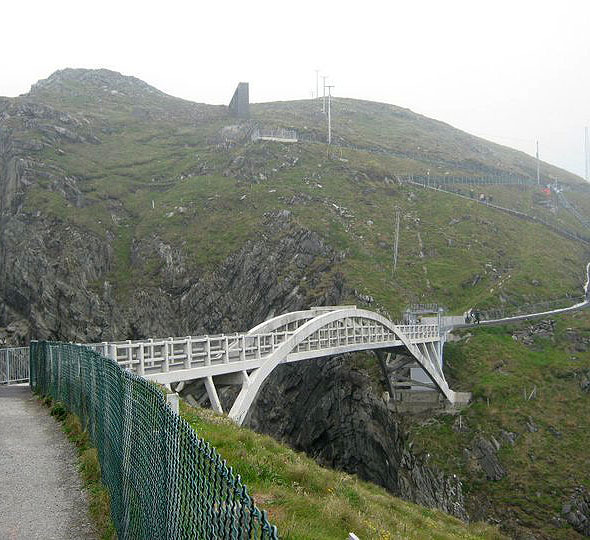 The new Mizen Head Footbridge is a reinforced concrete through-arch structure that spans 50m across a sea gorge (45m above sea level) to connect the island of Cloghán, at the tip of Mizen Head, with the mainland. It is almost an exact replica of the original 1909 bridge which was designed for the Commissioners of Irish Lights to access their lighthouse. It was decided to replace the original after deterioration in the concrete structure. The new bridge is 700mm wider as it is now a heavily accessed by visitors. The original bridge comprised both precast and in-situ reinforced concrete elements and is considered to be an early example of the use of reinforced concrete construction as a material in its day and the first reinforced concrete bridge built in Ireland. The 52m span was of record length for reinforced concrete arch construction. The original bridge designer was Noel Ridley of London.